Simple phone cable connections. RJ11-4 connector on the GPIO and 'Sense Board'. Use double sided tape for attaching to most materials. Great for Anti-Vandal installations, display window activation and more. Direct solder the phone cable for low profile installation! Use this touch sensor with the 'GPIO RJ11-4' adapter or GPIO-RJ11-8 adapter (shown below). Or Direct wire to the GPIO. This proximity 'capacitive touch sensor' can sense thru a variety of materials. Just stick on behind the glass, plywood or plastic panel, turn on power, you have a touch sensor located behind your display panel. 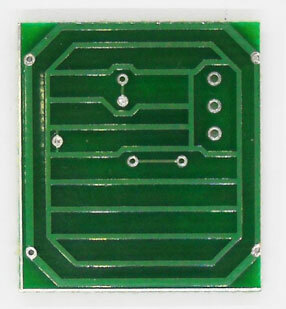 This sensor has been tested with 1.5 inches MDF material. Because the sensor self calibrates on power-up, it automatically adjusts to environment variations not only when power is applied. It also has 'long term' stabilizing algorithm built in. Because the sensor self calibrates to materials on power-up, it takes about 5 seconds for the sensor to stabilize. The BrightSign takes 20-40 seconds to power-up so the sensor is ready before the BrightSign is ready. The sensor has the gain set for about 1/2 inch proximity to the touch surface of the sensor. The sensor can be programmed for 'touch sensing' instead of proximity sensing. If you want the sensor to activate after you touch a surface, you will have to contact HMS Electronics Technical support with the specifics of your materials. Several 'trial and error' sensor modules may be needed to determine which is best suited for your application. Note on construction materials: Glass or Plastic do not have any effect on the sensor sensitivity. Wood and artificial wood (like MDF) have capacitive characteristics and can affect the sensor. Our testing of the sensor indicates that due to the 'Dynamic Calibration' of the sensor, many materials have very little effect on the proximity detection. However, any conductive material (like foil, metal plates and so forth) that is place in the vicinity of the sensor can effect the operation of the sensor. Do not put the sensor behind metal unless the metal is used as a 'touch surface'. Note on Paint: If paint is required on the 'proximity' side of the sensor, use a latex paint. Using paint with metallic particles in the paint may alter the characteristics of the 'proximity touch sensor'. Use this adapter if you want to use the RJ11-4 phone connectors and using an HMS-I/O board with terminal block. Use a 10 conductor cable (for 8 sensors) to connect from this board to the HMS-I/O board. These adapters are designed to attach to the Proximity/Touch Sensors to the GPIO connector of the BrightSign (screws provided for direct mount to the GPIO connector). Up to four or eight sensors can be connected to the BrightSign using these adapters. 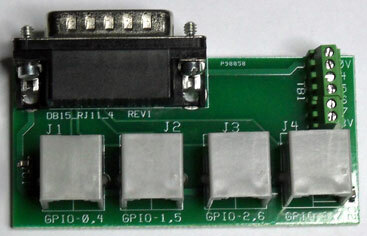 GPIO-RJ11-4: The four Sensor connectors goto GPIO 0,4 and 1,5, and 2,6 and 3,7. The connectors also have an extra wire (future use) that connects to GPIO 4, 5, 6 and 7 respectively. This 'extra connection' may be utilized for back-lighting or 'double sensors' in the future. There is also a terminal block on the GPIO-RJ11-4-TB with 0V, 3V, GPIO 4,5,6 and 7 connections. Note: Dual Sensor Boards coming (???) to be used with the GPIO-RJ11-4 adapters. 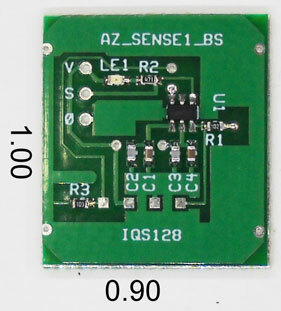 This adapter will allow attaching up to 8 of the AZ-Sense2 single sensor boards using the phone cable connections at the BrightSign end. Contact HMS Electronics 'Technical Support' for questions related to the 'Capacitive Touch Sensors'. The current draw on the sensor module is very low so cable length has almost no effect on sensor operation. Maximum cable length has not been determined. However, 100 feet (30 meters) is a distance that the module should work with. We suspect that the sensor could be 300 feet (100 meters) or more. Note: If not using the RJ11-4-4 or RJ11-4-8, then cut and strip the 4 wires for attaching to a terminal block. RJ11-1. Tie all 3.3V wires together and connect to 3.3V or 5V on the HMS Interface board. RJ11-2. Connect each 'Sensor Output' to the appropriate input of the HMS Interface board. RJ11-3 + RJ11-4. Tie all 0V (RJ11-3) and 'Spare' (RJ11-4) together and connect to 0V on the HMS Interface board. Note: The DB15-TB10-3V adapter is a suitable interface for connections.